While still a student in 1999 and passionate about IT, Daniel Klumpp is interested in the business sector of his father, manager of a biology medical laboratory. After having shared experience with several collaborators of the laboratory, M. Klumpp decides to develop an electronic documents management program. The company was created the 20th of October 2000 and started with its first client. The company will evolve and will win several prizes that reward the most efficient technological companies. Click on the event to see the description at the bottom page. The company Netika was created at the end of 2000, by its founder Daniel Klumpp. As an IT service provider, Netika specialises first in the development of the Quality applications, and then later in the laboratory management applications. The headquarters are based in Strasbourg, France. It is in 2002 that the Quality insurance software KaliLab is installed for the first client in France. KaliLab enables any laboratory to manage the quality management in its globality, from the staff management and their qualifications to the stock management. The laboratories can be sure of complete traceability for every step: pre-analytical, analytical, and post-analytical. This software meets the requirements of ISO 15189 and ISO 9001. Netika obtient sa première certification NF Logiciel par l'AFNOR pour le logiciel KaliLab. This certification guarantees an assistance to the use of the software and the taking into account of the modification requests from the final user. It ensures the conformity and the quality of all the functionalities of the software. By being certified, Netika places the client's satisfaction at the heart of its concerns and makes it its priority. It is in 2007 that Netika installs its first complete laboratory management software, KaliSil. It integrates all the Quality parts, with KaliLab's modules. After having found its place in hundreds of private laboratories, the software KaliLab is installed into its first Hospital Centre. It shows that it meets the standard needs and meets the private and public laboratory needs. Netika decides to complete its products offer while offering and integrating a result server, which allows laboratories to better answer to their clients satisfaction and their correspondents. In 2011, Netika decides to prove that the software KaliSil can also meet the needs of the laboratories that are outside medical biology. KaliSil is installed in the first food laboratory, a milk laboratory. Netika is expanding internationally! KaliSil is installed in a first Morrocan laboratory and proves one more time that the software can meet multiple needs and can perfectly adapt. Netika is developing internationally and is targeting North America. A first KaliLab software is installed in Canada. Netika wins a public tender to install the Quality software within the AP-HP (Assistance Publique - Hôpitaux de Paris). By its history, the AP-HP is the biggest hospital centre of France. After having found its place within several hundreds of private laboratories, KaliSil is installed in its first hospital. Netika continues its expansion internationally, and installs KaliSil in its first private laboratory in Algeria. Netika is willing to launch its first Quality management software dedicated to Medical Imaging, in 2014. Fini la transmission des résultats par papier. Dorénavant, tout passe par KaliDom ! En 2015, Netika remporte plusieurs appels d’offres. Alors que jusqu’ici, les références Hospitalières prépondérantes étaient celles de son produit KaliLab (Système de Management de la Qualité), Netika se positionne désormais avec KaliSil comme la nouvelle alternative des hôpitaux. Lancé en 2007, KaliSil fête ses 10 ans en 2017. L'occasion pour Netika de faire évoluer son logiciel KaliSil en KaliSil Néo. 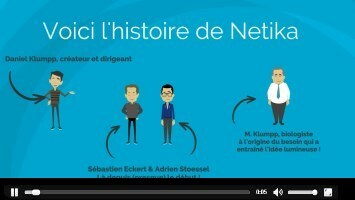 Netika fait évoluer le socle technique de KaliSil, qui permet entre autres la compatibilité multi-plateformes et navigateurs ainsi que l'interopérabilité. Un investissement important, qui permet la modernisation du système d'information.